Simulation games have always been one of my favorite genre. 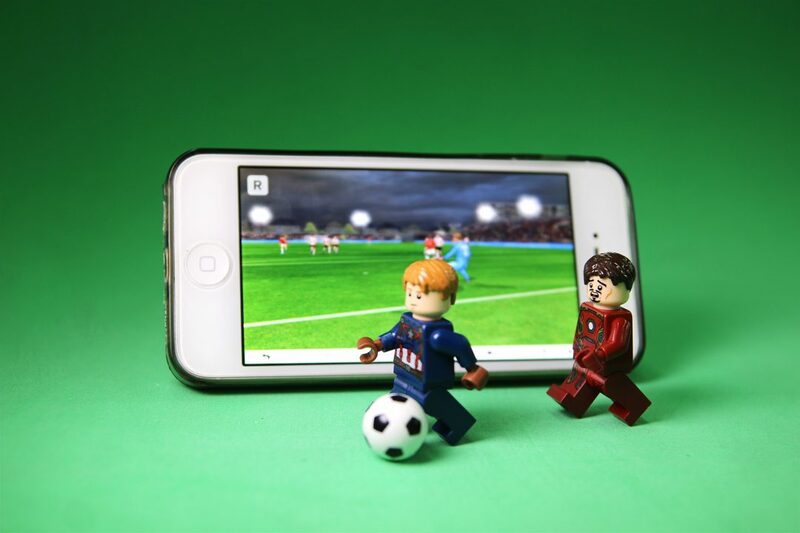 A simulation game is a game where you will be simulating various activities from real life. At the early development of simulation game, the true purpose of it isn’t actually for fun purpose but rather for real-life purpose such as training, analysis, or prediction. Most simulation games trying to tell the player about how they think a real situation from their game would happen. But as time goes by, so does the evolution of simulation games. Now they’re not just focusing on detail and real-life simulation, but also broaden its range to a more friendly, simple, and fun games. The history of simulation game is a bit blur. While many credits the notorious Sim City as the first simulation game, Coleco Vision claim themselves as the game that inspires Sim City. 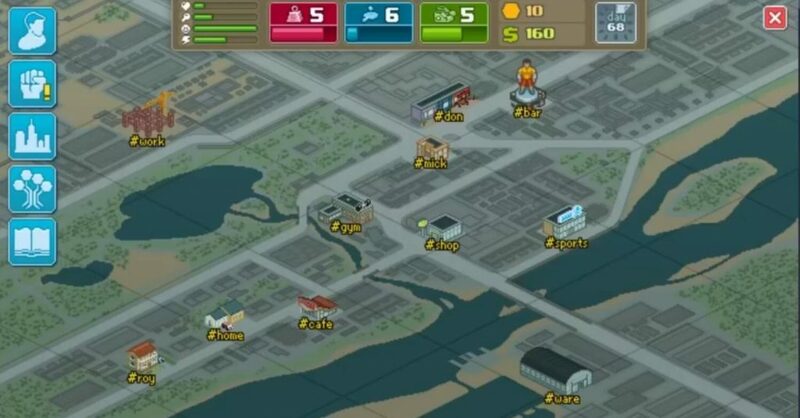 Since the success of Sim City, simulation games is like the genre that would never dies. This genre always has its own fan base that would never fade away. Just like the time when I was a child, the time when Tamagotchi was first released in public, 20 years ago. It’s like everybody feel responsible to raise a digital pet that’s just as large as any keychain, and can be brought anywhere they go. That’s exactly the same concept that I thought when simulation games being brought into iPhone. It’s like you have your own tamagotchi again, but this time, it’s not just digital pet, you can even bring a street fighter everywhere you go and have him develops into a tough fighter. Combining strategic decision and simulation together is what Lazy Bear Games and Tiny Build wanted to present to the players. With these combinations in mind, along with the passion to bring back nostalgic feeling into modern game, Punch Club is born. It all started twenty years ago. The time when you, as the main character, were witnessing the murder of your father by some mysterious guy in a black cape, with some red blinking eye. That was weird, but still, you’re growing up under the care of a guy name Frank. He’s been real good to you, but now you’ve grown up, you now have to make a living yourself. While you decide to go get some work, you’re being robbed by two mobsters. Obviously, you lose, big time. That’s when a guy name Mick come and say that he can help you, making yourself a great fighter. Then, your journey starts. I name my character Munyuny (just some random word, I found it sound really funny when being pronounced). With Munyuny, or whatever you want to name your character is, you will be taking journey to become the ultimate fighter. During that journey, you will have to make yourself a lot stronger than the time when you’re beaten up by some mobsters. You will also have a lot of decision to make, that will affect the storyline of the game. While strengthening yourself, you will also need to climb up the rank of the ultimate fighter by joining in some fighting competition, both street fighting and official fighting. The more you fight, the more improvement you will have. You will be able to learn the way of fight, learn some fighting style, get to know some new people, and who knows, perhaps you will find someone you love from this game. Punch Club tries to simulate the story of how a normal person develop himself into a strong and unbeatable fighter. You will have two types of status for your character. The first one is the emotional condition, and the other one is for your fighting ability. In Punch Club, you don’t have any deadline. You can do whatever you want, whenever you like. Seriously, no one will be like, several days left before you died, or things like that. If you have any goal that will finish the game, is to continue the storyline. If you have some limitation though, is that at every end of the day, your fighting ability will always be deducted. So spend the day sitting and watching SPONGEBOB, and you will be weak like a sponge and you won’t be able to finish the game at all. Punch Club‘s story lies inside a city, so you will have to move from one place to another place. You will have two options, you will move by walking or by using the bus. If you’re walking you will be spending some time, on the other hand, paying some money if you’re using the bus. So time is really precious in Punch Club. Like I’ve said, you have two status types for your character. The emotional condition is divided into four parts. Health is needed for your fight, Hunger can only be replenished by food, Happiness will be filled when you’re doing something fun like watching SPONGEBOB, talking with someone you like, or by fighting. The last is Energy, can be replenished with some good night sleep or some energy drink. You will be fighting a lot in this game. So the next status will be deciding if you’re going to win anything in this game. There are three different status, each representing a fighting style of their own. STRENGTH will affect your base damage, AGILITY will affect your accuracy as well as dodging percentage. Last, STAMINA will make sure you will never run out of energy and fighting at top condition. To increase this status, you will have to train yourself. You can do this at Silver’s gym, or purchasing some workout equipments to train yourself at home. There’s always the right equipment for the status that you want to train. So you won’t be increasing your AGILITY by running in a treadmill, or never wish your STAMINA will increase when you just weight lifting inside the gym. When the time has arrived for you to fight, you will be doing some strategic thinking against your opponent. As you see from the screenshot below, there are some slots and several panels available to choose before you start your fight. The slots in red circle is representing the move that your character will do inside the fight, while the panel in blue circle represents all the moves your character is able to do. When the fight starts, you won’t be able to do anything. All the fighting is done by the AI. All you can do is just sit back and analyze your enemy. 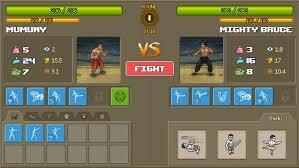 Then, when the round is over (like boxing match), you can decide your fighting strategy again. Upon fighting, your character will be given some extra $ and skill points, if you won the fight, that is. Using these points, you’d be able to improve your character’s skills. Either by passive skills or by learning some new fancy moves. You will also be reminded by Franky from his fighter guide book that to become a great fighter, you’ve got to focus on just one status. When you do, you will have three different fighting style, each represent the three status. The Way of Bear represents strength fighting style that relies heavily on base damage. The Way of Tiger represents quick and agile fighting style. It relies on dodge, kick, and counter-attack. The last is The Way of Turtle which represents stamina and relies heavily on defensive moves. Punch Quest makes it impossible for player to be able to learn all the techniques. You can just learn only one fighting style. Trust me, the fighting style that you choose will just as cool as one to another. So don’t worry to enjoy focus on just one fighting style. There are, however, three save slots available, just in case if you want to try playing all three of the fighting style. Out of the genre which I already loved. There are some other things that I liked a lot from this game, that possibly move you, to play this game as well. I like the 16 bit pixelate art being implemented in Punch Quest. I think this pixelate art brings nostalgic feeling while playing. Moreover, you could enable the retro mode, a feature that will add some sort of classic noise that we usually had in our old TV. These two clearly bring some vintage style in the game. I actually love the whole story in Punch Quest. Revealing the mystery of who is the actual killer of the father, the story line that acts as the progress marker, the cut scene that gives a cinematic feeling, the story was made in a really good presentation. However, once when you’ve finally finished the game, it’s like I’m being hanged up by the game. It is indeed said that they will continue the story, but the effort of me to find out the killer isn’t worth it compared to how short the answer to it is. Despite how short the conclusion is, being able to strategically choose the move that I can bring to the battle keeps me thinking of the best move combinations. Then on the next round, trying that combinations, and so on. Being able to choose the fighting style also is a good reason to replay the game from scratch. There’s also some decision that once you take, will affect the experience that you will have throughout the game. You can’t re-choose any decision that you’ve made. So if you’ve decided to reject offers to join the gang member, you can’t change your mind to become the bad guy again. On the other hand, all your friends will give their best effort to make sure you’re not falling to the dark side. So you can resign on being the bad guys and re-joining the light side. Lastly, I love the attitude of the developers. I think the idea of featuring parody of well known fighters as well as putting easter eggs here and there are brilliant. I won’t spoil you who are the characters or the position of the easter eggs that I’m talking about, but you will recognize them. I’m sure of it. If you don’t, these are some easter eggs I found on the Steam Community. Punch Club is a great fighting simulation game. It has great replay value. It gives you reasons why you should restart the game, choosing different options, and playing style. This game definitely would not be suitable for most women, but if you feel masculinity is calling you, I’d be more than happy to recommend you Punch Club from Lazy Bear Games. 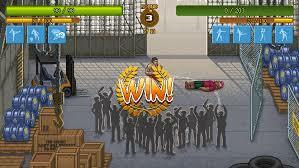 Punch Club states itself as a fighting strategy simulation game. So, it has a lot of strategic thinking and decision that you have to make. For this guide, I’m gonna break it out into several sections, from beginner guide to a more advanced as how to finish this game under 100 days. So let it begin. So let’s start with the first decision you have to make in the early game. This decision happens when you’re being robbed by mobsters. You will ask yourself, if you want to run, fight, or surrender. Either way it will lead to your lost. But then, you will get your first perk. This perk is really crucial as how you will choose your playing style. Just like choosing pokemon starter monster, fire, nature, or water. If you choose to run, you will get “They used to call me “legs” at high school“, then you will have Strong Legs perk. This will make you choose stamina based fighting style. Choose the way of turtle and you will have a super defensive fighting style. 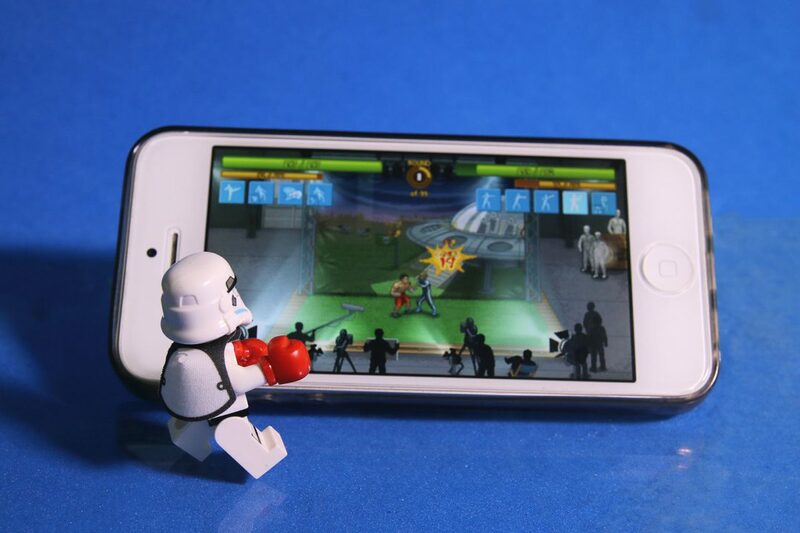 Each fight will take longer than the other two, but you will be super powerful against any opponent. Also make sure that you have block in your starting moves. Next one is if you choose to fight. You’ll get “Ive always had a pretty great right hook“, and it will give you Strong Arms perk. Strength with high base damage suits best for this perk. Choose the way of bear and you will be beat your opponent with ease. Make sure you get block as one of your starting ability. The last one is if you choose to surrender. “I may look skinny but I’m quick” will give you Thin Guy perk. This perk is most suitable for Agility fighting style. Well, you certainly can, choose another perk, but if you’re taking my suggestion, play agility and choose the way of tiger. Make sure that your starting ability gives you dodge, otherwise, I’d suggest you to restart your game. As you may have known, each style has their own playing style and approach. 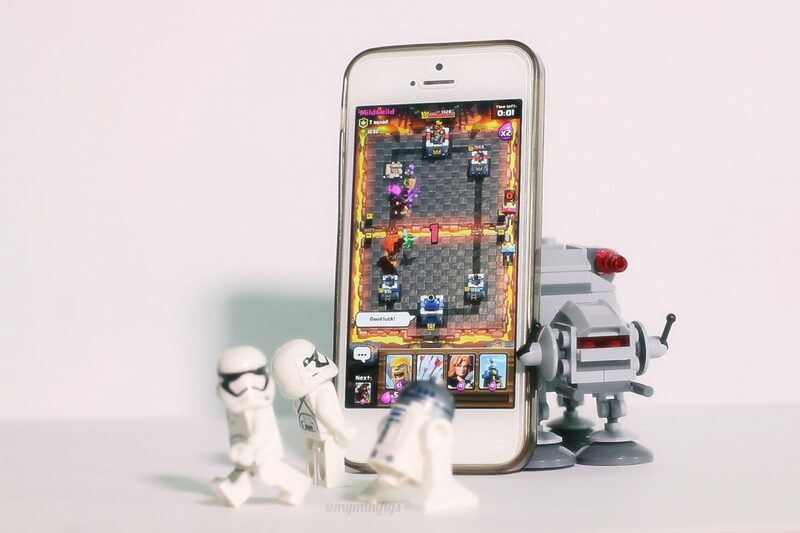 They also have different strategy right from the equipments and skills. So far I’ve finished the game using the way of tiger and using the thin guy perk. So this is my build that I’ve used up until the end game. Thin guy tend to dodge, so at the early stage, I used kick and dodge. At the mid game, when I’ve unlocked third slot and way of tiger, I just used three skills, kick, dodge, and counter. I’m literally just need these three, so I chose to upgrade passive skills, then I unlocked the rain of strikes skill as a backup for a turtle or bear enemy. Then when I’ve unlocked the four slot, I added crossroads as another counter damage. This skill doesn’t stack with wind flow dodge, but it’s stackable with other counter skill like unstoppable. So it’s like I’m increasing my dodge rate with these two dodge moves. At the end of the game when I’ve unlocked the fifth slot, I didn’t add anything beside another kick move. 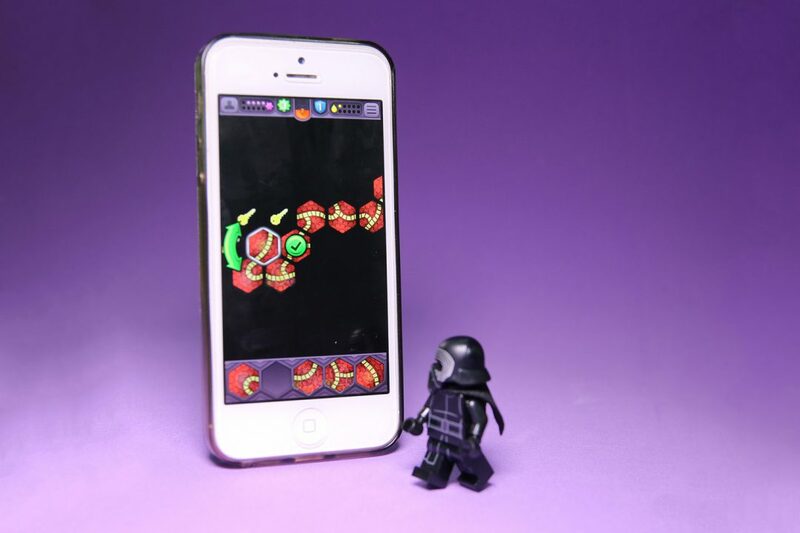 Cobra Strike was necessary for one stage since it will damage your opponent overtime. I used it just on one stage and change it with other move afterwards. Regardless of your fighting style, these are some general tips that I think should be suitable for all of you. Just like any strategy game would suggest, Punch Club is all about efficiency and effectively. Whenever you’re doing something, make sure it gives you the most profitable return. These are some points that I think you should consider before you start your adventure. Meat is the best food available for the early game. Happiness can be obtained through fight, so don’t bother if your work is draining your happiness. Once you fight, your happiness will be refilled. Make sure that your happiness is suffice for your workout though. You can spend out all your money at the early game to buy some food, then you can go to Mick once you’re hungry. He will gives you some free food for several times. He will tell you that he’s going to stop feeding you. Make sure that you don’t bring too much money around at the early game. $150 coins should be more than enough for you. At least before you’ve unlocked “The Way of …”, don’t bring more than $150 in your pocket. Otherwise some mobsters will come to you and try to take your money. With skill points, you will be able to get more powerful skills. Beside doing some ranked fight or ultimate fight, there are several other ways for you to get skill points. Each day, Silver will give his time for you to do sparring or padding. This is a must visit for you, to get skill points as fast as possible. The other way to get skill points is by sparring with Roy. To do this, you have to get his attention. It takes about 5 hours to get his attention, divided into two works. 2 hours working on his car, and 3 hours to chill with him. Then you will be able to ask him to either accompanying you workout or sparring with you. “Lazy Bear Games” is a small indie game studio based in Saint-Petersburg, Russia. Studio was founded 6 years ago by two friends as Game Jam Studio and changed its name to Lazy Bear Games in April 2015. These two friends started game development as a hobby and now it is their full-time job. Spending childhood in the era of NES/Sega consoles, TMNT cartoon series and movies with S.Stallone, A.Schwarzenegger, J.K.Vandam spread on VHS cassettes, they want to make a game full of nostalgia and different references to the culture of that time. They are big fans of strategic games of all kinds. So, they decided to mix these 2 things and the idea of “Punch Club” came out. By now they saw positive response from media and gamers from around the globe and excited to make really awesome game. Punch Club is provided for my most honest review from the guy behind this awesome game, Lazy Bear Games and its publisher Tiny Build Games.